As I travel the state speaking with publications in all 99 counties, relevant and healthy discourse takes place. Publishers, editors and reporters ask questions like: How do we fix Medicaid? How do we revitalize our economy? How do we grow our population? How do we repair our education system? Their grasp of substance is an even greater indictment of the paper Iowa used to depend on. 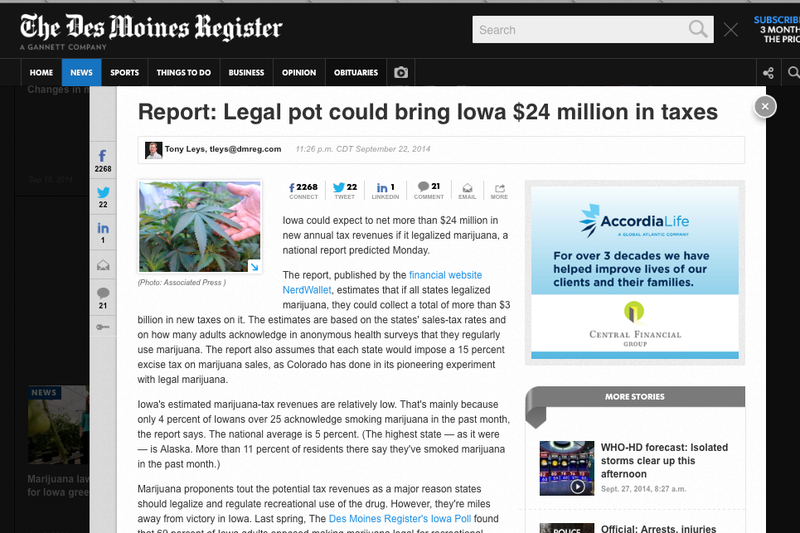 Then a few days ago, I read an article in The Des Moines Register regarding the purported state revenue legalized marijuana would generate. I was appalled. It was a glaring example of how lazy and uninformed journalism does more than cheat the reader. This sort of mis-reporting harms the communities the publication claims to serve. Yet again, The Des Moines Register was publishing misinformation without any thought to the potential damage they caused. Damaging because now is the time for a meaningful discussion regarding re-legalizing marijuana, and what that would mean for generations of Iowans. And, that’s when it occurred to me. The resignation of The Des Moines Register as a member of the 4th Estate is likely not due to just agendaneering. Sloth, and incompetence are factors, too.